This week’s mandala design theme is inspired by the amazing mandala pictured above designed using stickers! Get a closer look at how this intricate mandala was created OVER HERE. As I was planning my own sticker mandalas I thought about collecting ocean themed stickers. Out of the blue and without knowing my desire for such stickers, I received *THIS WATER BOTTLE* in the mail that was fashioned to be a mailing tube. Catherine Calvetti was clearing out her studio and found several things she thought I would enjoy. Among the contents were a lot of stickers in the very theme I was interested in. Wow! Now how cool is that? I love it when synchronicity strikes! Although I didn’t have as many stickers as the mandala I was inspired by, I didn’t let that stop me from creating my own mandalas and in my own style. For the first mandala I started by painting a black circle. I really had fun selecting the various shapes and colored stickers and arranged them in several circles. I finished the design by adding little details using a white gel pen. Looking at this mandala now it looks like a record. 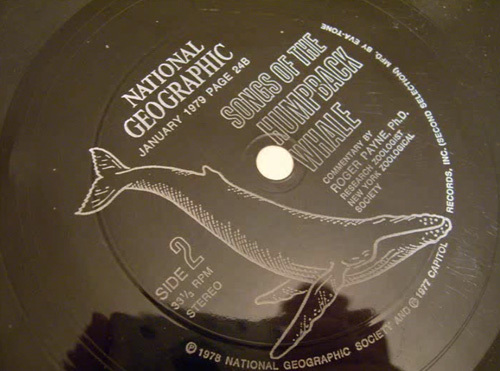 With the whales at the center the title “Whale Song” emerged. Click on the image of the mandala to view it enlarged. 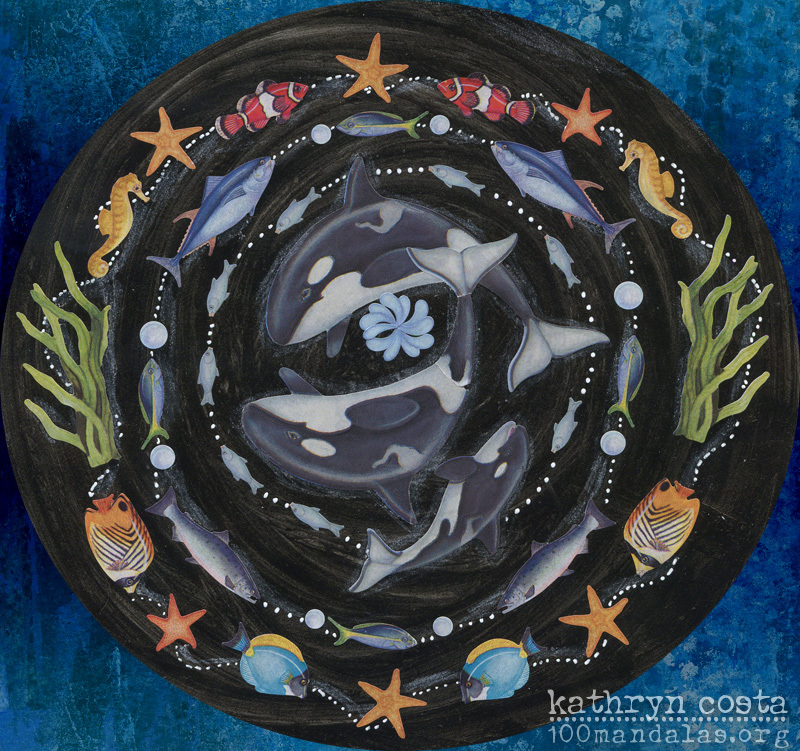 Looking at this mandala triggered a fond memory of when I was about 10 years old and a vinyl page tucked in a National Geographic magazine introduced me to the sounds of the whale song. I remember my Dad putting this flimsy piece of plastic on the record player and us kids sitting around listening, ooohing and aaaahing. I was so impressed with the unusual sounds. It felt like we were eves dropping on the humpback whales from our distant home in New Hampshire. CLICK HERE to listen to this very same record from 1979. For my second sticker mandala I arranged the stickers on a white background and connected them with black doodles using a micron pen. It really was fun creating these mandalas. It felt like piecing together a puzzle. Try it! You may be surprised at how fun it is to play with stickers. 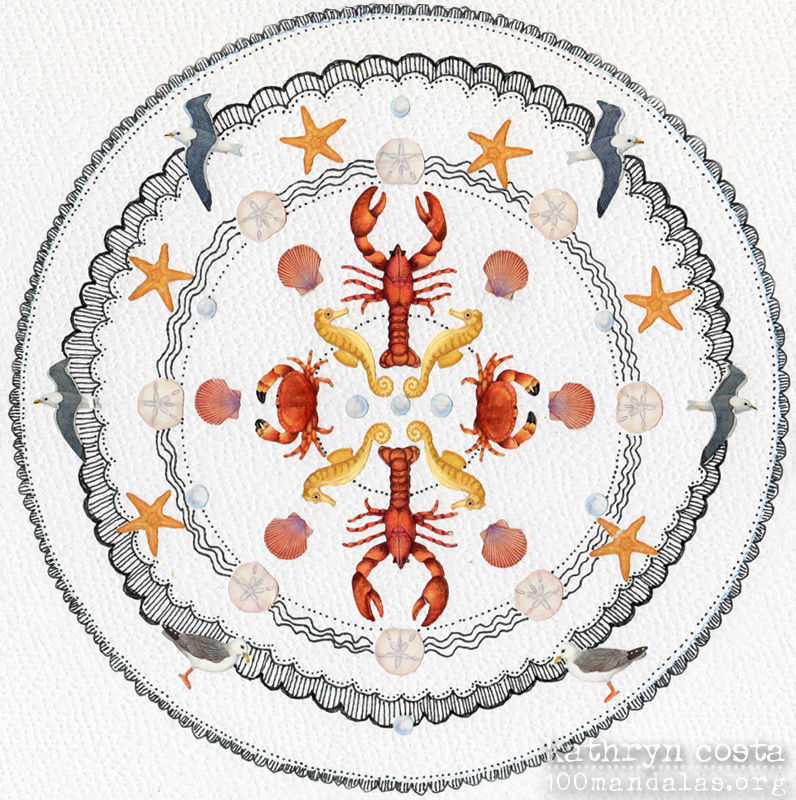 Post your mandalas in the 100 Mandalas Sharing Circle. Get more inspiration from my book, The Mandala Guidebook. I just came across you a few hours ago on YouTube – I’m *very new* to adult coloring and I’ve already purchased almost 10 books with several (+ many + several more! lol) marked as WishList and Save for Later items on http://Smile.amazon.com ! Next Post150 Tree Illustrations to inspire your mandala practice.